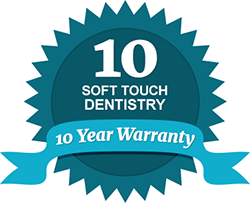 Welcome to Soft Touch Dentistry, where your comfort is our priority. We provide complete family dental care to the residents of O’Fallon and the surrounding St. Louis area communities in a warm, yet contemporary environment. Dr. Sarah Thompson leads our practice as a highly skilled and talented family and cosmetic dentist. You can trust that our friendly team of professionals is dedicated to excellent patient care as we use the latest advancements in dentistry to keep your smile healthy and attractive for years to come. From our ultra-low exposure digital x-rays and mercury-free fillings to our advanced clear braces options and top quality restorative services, you can be confident that your family’s oral health is in good hands at Soft Touch Dentistry. Dr. Sarah Thompson is an experienced cosmetic dentist who is well known in the O'Fallon and St. Louis communities. Not only is she attentive and personable with each patient she treats, but she also carries distinguished skill and talent in a full range of cosmetic dentistry services to correct teeth that are discolored, misaligned, chipped, gapped or otherwise unattractive. Whether you desire professional teeth whitening to brighten your smile or a full smile makeover to transform your look, Dr. Thompson is passionate about helping you achieve your goals. With over 10 years of experience and specialized training, Dr. Thompson is a dentist you can trust to enhance any aspect of your smile. Our practice frequently welcomes out-of-town patients who want the very best in cosmetic dentistry. We offer top quality services such as lumineers, porcelain veneers, crowns and bridges that can restore your smile with the natural, beautiful results you deserve. At Soft Touch Dentistry, we are pleased to take care of your entire family’s dental needs. From children to adults, we take extra measures to ensure your dental experience is as comfortable, safe and pleasant as possible. Our eco-friendly environment features movies on a large screen TV, relaxing music, warm blankets, as well as sedation dentistry, to keep you at ease during your dental procedures. As part of our commitment to our patients, we make every effort to keep our appointments running on schedule out of respect and value to your time. For a caring dentist who is highly qualified to provide preventative, restorative and cosmetic dentistry to your family, contact our dental practice today. We are currently accepting new patients and we look forward to helping you achieve and maintain a beautiful and long-lasting smile. Our office works with many dental insurance companies and we offer flexible financing options for your convenience.